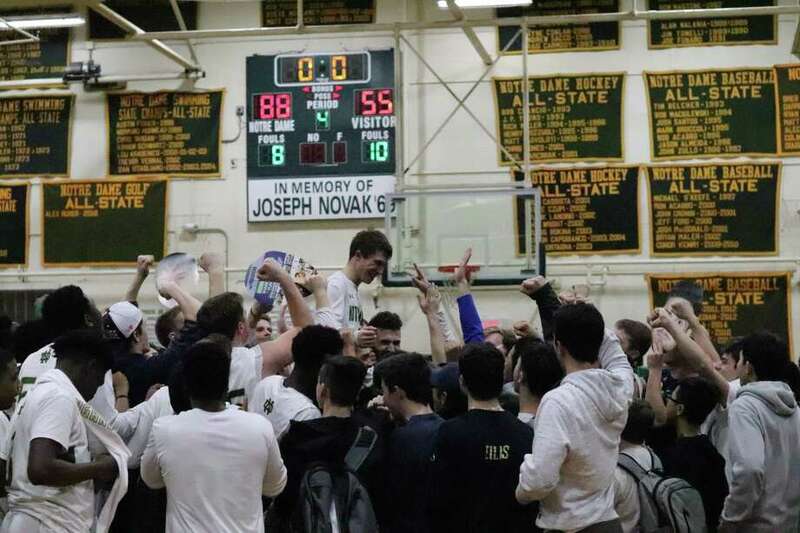 Notre Dame-West Haven manager Matt Callahan was carried off the court after hitting a 3-point on Senior Night Friday against Career. Callahan has been a team manager for the Green Knights since he was a freshman. Before the start of this season, head coach Jason Shea promised Callahan he would get to suit up on Senior Night. “I put him on the CIAC roster on Day 1,” Shea said. Notre Dame was well on its way to its 18th straight win versus no losses Friday night when the chants from the crowd came to put Callahan in against Career. Shea did so with 4 minutes left. Then came the moment that has made the rounds on social media. Let’s let Callahan tell the story. Many of the fans at Tonelli Court and the entire Notre Dame bench stood in celebration. “I think it was sort of icing on the cake. Getting in the game meant the world to me to. To make that shot was incredible,” Callahan said. Callahan did take another shot, but missed. So he ends up shooting 50 percent for his career. Shea said Callahan was cut from the team as a freshman, but then offered the opportunity to be the team manager. He’s missed just one practice in four seasons. Many Sundays, Callahan beats the head coach to the gym. “He usually gets 500-700 shots up before practice starts,” Shea said. Right down to the way his fellow teammates and students lifted Callahan up on to their shoulders after the game, it’s not hard to make the correlation to a famous walk-on football player at a certain college university by the same name that had his moment in the sun turned into a movie. Callahan is looking at Providence as a possible destination for college. He plans to major in marketing. “I’d love to be a team manager at the college level,” Callahan said.